The European Association of Communication Directors (EACD), which was founded in Brussels in 2006 by over 100 inhouse communicators from 23 countries, and now has over 2,000 members, is the network for communication professionals from all fields across Europe. It was established to foster diversity, overcome cultural barriers and formulate communicative norms and expectations. The Association meets the needs of communication professionals working internationally, and provides them with support in the face of the exciting new challenges they deal with in the global arena. The world of communications is constantly in flux as new technologies influence the way communicators work, therefore the Association is committed to providing support and opportunities for its members to learn from their peers. Learn more about the EACD at our website here. Communication Director is a quarterly magazine dedicated to corporate communications and public relations as practised in Europe today. The magazine explores communication strategies and theories and presents recent case studies alongside expert analysis. Leading communicators are introduced via in-depth interviews, and articles are contributed by leading academics as well as corporate heads from some of Europe’s leading organisations. Visit the Communication Director website here. How will your career vision become reality? Quadriga is your partner for professional development and future expertise. We interrogate the status quo and put your questions under the spotlight – for a continuous professional growth. 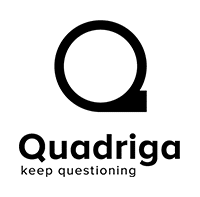 Visit the Quadriga website here.